Maputo — It is not only opposition parties whose appeals against the results of the 10 October municipal elections have been thrown out by the courts - the latest ruling from the Constitutional Council, Mozambique's highest body in matters of constitutional and electoral law, supports the decision by the district court in the northern city of Cuamba to reject an appeal from the ruling Frelimo Party against the results in thus municipality, which was won by the main opposition party, the former rebel movement Renamo. The court and the Council threw out the Frelimo appeal for exactly the same reason that several appeals by Renamo have been rejected - namely, that there was no prior objection at the polling stations or, in the case of the municipality-wide result, at the district elections commission. Frelimo even admitted that its appeal was a day late. It said there was a serious disturbance at one polling centre, in which gunshots were fired. Counting of the votes was interrupted, and when staff tried to resume the count at four polling stations, they found that the ballot papers had disappeared, as had a computer belonging to the Electoral Administration Technical Secretariat (STAE). Frelimo believed that this had materially affected the result of the elections. It called for the voting at the affected polling stations to be declared null and void, and for new elections to be held there. But Frelimo did not protest at the time (on the evening of 10 October). Instead it waited for the following day, and in its own document said it had submitted to the Cuamba District Elections Commission "a complaint replacing the one which should have been made during the voting, in which it reported in minute detail the events of the preceding day". 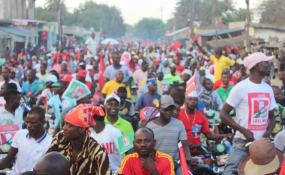 Since there was no protest from Frelimo at the time of the alleged events, the District Court believed it had no alternative but to reject the appeal, and the Constitutional Council agreed. The Council said it had looked through all the records and found no sign that Frelimo had obeyed the procedures laid down in the electoral law "concerning the imperative duty to protest at irregularities at the polling stations or in the intermediate count at the moment they occur". The Constitutional Council also supported the court in Alto Molocue district, in the central province of Zambezia, which threw out a Renamo appeal against the results in this municipality, again because it had not made any objection at the polling stations. Renamo said the local branch of STAE and the Alto Molocue District Elections Commission had transported the voting material to the provincial capital, Quelimane, without the knowledge or presence of the opposition parties. It added that Renamo representatives were illegally prevented from attending the intermediate count, at which the results from all the polling stations are tallied. Those members of the District Commission appointed by Renamo, were not even given a copy of the results sheet from the intermediate count. The results were only posted publicly on 16 October, after the district court had ruled against Renamo. Renamo said the Frelimo victory in Alto Molocue was forged, and that, according to its copies of the results sheets from all the polling stations, Renamo had won with 1,135 votes more than Frelimo. But the Constitutional Council said there was no sign that Renamo had made any protest at the time that it was denied entry to the intermediate count, and so it supported the court's decision to reject the appeal. Nonetheless there is no serious doubt that in reality Renamo won in Alto Molocue. For there happens to be a complete parallel count in this municipality done by observers from EISA (Electoral Institute for Sustainable Democracy in Africa) which gave Renamo over 50 per cent of the vote. Renamo also appealed in Nhamatanda, in Sofala province, where it alleged ballot box stuffing. It said that in five polling stations there were discrepancies between the number of ballots cast and the number of people who had voted. It also claimed that people from outside the Nhamatanda municipality had voted. Renamo said it tried to protest at the time, but the polling station presidents refused to give the Renamo monitors the complaints forms that are included in the elections kit delivered to every polling station. But the court ruled that here was no evidence to back up the Renamo claims, and the Constitutional Council agreed. (The Council has also, in previous rulings, said that, if polling station staff refuse to hand over the protest forms, the injured party should notify the police and a higher electoral body). To date all Constitutional Council rulings on election appeals have been unanimous - which means that they were supported by the sole Council judge appointed by Renamo, Manuel Franque.